Straight stair lifts are for stairs that do not have turns or landings between the top and bottom landing. Curved stair lifts are for stairs that have a turn or landing between the top and bottom landing. Outdoor stair lifts are designed to be installed and used out in the elements. We sell and install both straight and curved outdoor stair lifts. 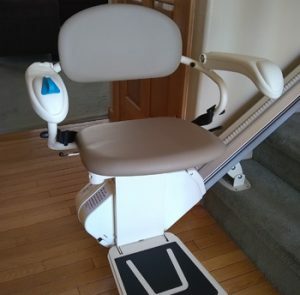 Used stair lifts are lifts that we have purchased back from our customers. The lifts have been thoroughly inspected and cleaned. Any necessary repairs have been made. Rental stair lifts are a great solution when a lift is needed for a short period of time. Options HME carries a variety of stair lifts to suit your home’s needs. We not only specialize in stair lift installation, but also service after the sale. Regardless of the model you choose, Options HME provides a 1 year labor warranty. After the 1 year warranty, we continue to provide service, giving you the option to purchase an additional labor warranty or pay per hour. Our stair lifts also carry some of the best stair lift warranties on parts, including some models with a lifetime warranty on the motor, gears, and rail. 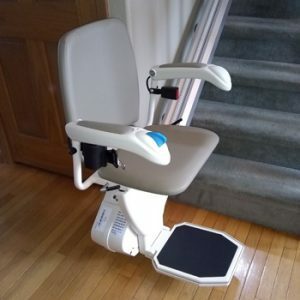 Can a stair lift be installed outside? We carry outdoor stairlift models. While a regular stairlift cannot be installed outside, outdoor stairlifts are designed to handle the wet/dry and hot/cold conditions of the outdoors. If you need a stair lift to help you up and down the steps to a porch or deck, check out the outdoor stair lifts that we provide. How is a stair lift powered? Powering a stair lift is very simple. All of the models that we carry plug straight into a normal wall socket, so no additional wiring is necessary in most homes. We are often asked “will it work if the power goes out?” Yes, the stair lifts we offer are powered by a set of 12 volt batteries, so in the event of a power outage, the lifts will still work. Some units can make up to 60 trips on just battery power alone. Our Handicare Xclusive has an optional continuous charge feature, meaning it will charge at any point on the rail.